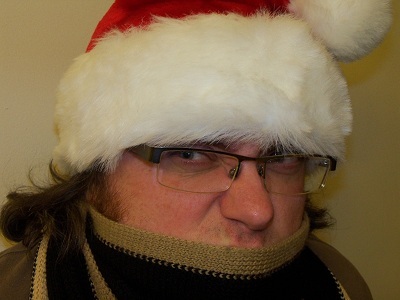 Paranormal folk songwriter Jonah Knight has a new album, called Another Creepy Christmas. A Kickstarter funded album about creepy Christmas songs. Not since Nightmare Before Christmas have I been so scared of Christmas. The album consists of ten music tracks, plus one spoken word track, some being old Christmas songs done in a new creepier way and some being all new scary songs. The classics include an angry version of “Getting Nothing for Christmas” that makes you wonder if he is going to get revenge for being snitched on; “We Three Kings” duet that seems to focus on the stranger lines of the song; “Santa Claus is Coming” as if it was a warning; “Santa Baby” which is only creepy because Jonah is singing it. The new songs are pretty original. One is about the Icelandic Christmas figures the Yuletide Lads and basically tells what each of the thirteen do. The Krampus gets his own song telling of the horror that he will do to bad children. “Lonely Christmas” is sad little tale of being alone for Christmas, but that’s ok. “Perfect Tree” a song about wanting the perfect Christmas tree and other holiday elements, while serving his prison time for a crime spree; very up beat. Jonah does a duet with comedy nerd rocker Mikey Mason. Mikey spends the song trying to tell Jonah about the happiness and joy for Christmas. It does not really work to well. At least they are able to agree on the importance of commercialism and alcoholism. Mikey also shares some of the ‘naughty’ parts of the season too. There is also an insert done of “Yes, Virginia” done pretty straight forward. This album works both something to play during the Christmas season and Halloween season as well. Right now you can only get the album digitally, but physical CDs of the album are on the way. So if you like want to creep people out this holiday season, this might be the album to check out. One last creepy Christmas picture to enjoy. Update: Here’s a chance to win your own copy of Another Creepy Christmas. Thanks again! I’m glad you like the album. I think I may quote you.